Public art is a crucial tool for creating a sense of identity for the Division Midway community. In urban design lingo, public art components are Placemaking and Placekeeping. Placemaking relies on the participation of community members and local assets to work toward a healthy and sustainable community. Neighborhood-centered urban design encourages creative patterns of use and pays attention to the physical, cultural, and social identities that define a place and support its evolution. DMA’s process is guided by local community input, taking time to listen to, learn from and empower diverse voices for a vision of dynamic and inclusive civic space. Placekeeping will help maintain the vitality and diversity of the Division Midway dsitrict. Together, Placemaking and Placekeeping help maintain cultural memories, advocate for affordable housing, and strengthen social connections to the place we live in. The Kresge Foundation through Transportation for America has provided three grants to DMA and our partner, the Jade District, for Placemaking. These grants fund local artists, whose work expresses the intersection of transit and displacement due to the Division Street High Capacity Transit Project slated for completion in 2022. Funded by an East Portland Action Plan grant and Tax Increment Funds managed by Prosper Portland, was created by three David Douglas students. 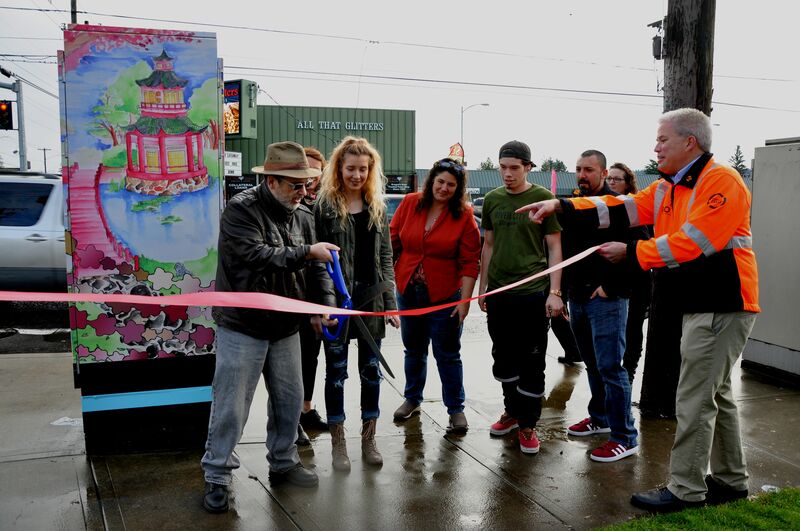 Their artwork was transferred to a utility box at 122nd and Division. 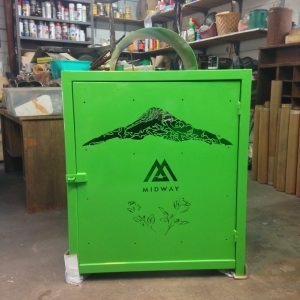 DMA also partnered with Morpheus Youth Project, the Portland Bureau of Transportation and the Regional Arts & Culture Council on the Art on the Box project. The annual Festival of Nations by Division Midway Alliance is the largest multicultural event east of I-205. In 2016, the Regional Arts and Cultures Council awarded DMA an Art Equity Grant to support the Festival of Nations. These community trash cans were installed in 2017. They are both artistic and useful. The design and color were picked by committee members!